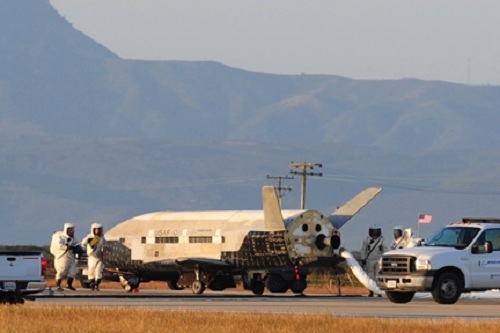 The reusable Boeing-built X-37B Orbital Test Vehicle touched down on a runway at Vandenberg Air Force Base, Calif., at 5:48 a.m. PDT (GMT-7). The Air Force did not provide any advance warning of the re-entry and landing time and no technical details about the vehicle's performance were released. But in a statement, the Air Force said the autonomous landing by the nation's "newest and most advanced re-entry spacecraft" was executed "safely and successfully." "With the retirement of the space shuttle fleet, the X-37B OTV program brings a singular capability to space technology development," Air Force Lt. Col. Tom McIntyre, X-37B program manager, said in the statement. "The return capability allows the Air Force to test new technologies without the same risk commitment faced by other programs. We're proud of the entire team's successful efforts to bring this mission to an outstanding conclusion." The X-37B was launched atop a United Launch Alliance Atlas 5 rocket that took off March 5, 2011, from Florida's Cape Canaveral Air Force Station. It was the second flight for the Air Force Orbital Test Vehicle program following a successful 224-day maiden voyage in 2010. The spacecraft used for that mission is expected to be relaunched in October. As with the initial test flight, details about the program's just-concluded second mission are classified. Built by Boeing's Experimental Systems Group, the X-37B is equipped with twin tail fins, stubby wings and an advanced heat shield. It is about one quarter the size of NASA's now-retired space shuttle, measuring 29 feet long. It has a wingspan of just 14 feet and weighs about 11,000 pounds when loaded with propellants. "With OTV-1, we proved that unmanned space vehicles can be sent into orbit and safely recovered," Paul Rusnock, Boeing vice president of Government Space Systems, said in a company statement. "With OTV-2, we tested the vehicle design even further by extending the ... mission duration of the first vehicle and testing additional capabilities. The spacecraft was originally developed by Boeing for NASA and the Defense Advanced Research Projects Agency, or DARPA, but it eventually was turned over to the Orbital Test Vehicle program operated by the Rapid Capabilities Office of the Air Force. The unmanned orbiter is based on the same lifting body design used for the space shuttle and flies a similar re-entry trajectory. 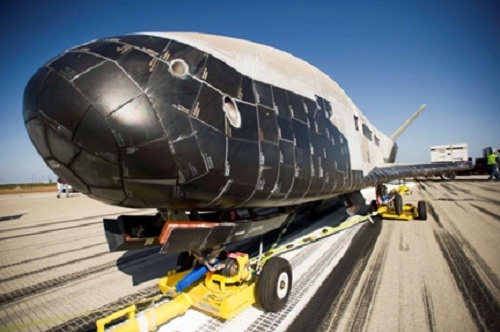 But the X-37B features more lightweight composite materials, improved wing leading edge insulation and tougher heat-shield tiles that "are significantly more durable than the first generation tiles used by the space shuttle," according to a Boeing website description. "All avionics on the X-37B are designed to automate all de-orbit and landing functions." 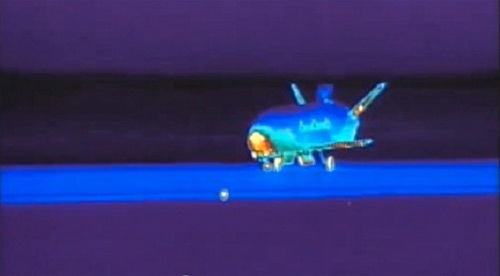 The X-37B features a scaled-down 4-foot by 7-foot payload bay. But unlike NASA's manned orbiter, which relied on fuel cells for electrical power, the Air Force spaceplane is equipped with a deployable solar array that permits it to remain in orbit for long-duration missions. What else might have been carried aloft during the OTV program's second mission is not known. The possibilities include reconnaissance cameras or other spy sensors; test gear to precisely measure the craft's performance over the course of a long-duration mission; and space exposure experiments to help researchers learn more about the long-term effects of the space environment on sensitive materials or instruments.